Skills day 2008: what did you think? Thanks to everybody who came to this year’s event and helped to make it such an interesting and stimulating day. We’d love to get your feedback – what worked and what didn’t – on everything from the venue to the programme. Feel free to leave your comments in the box below or, if you’d prefer, email them to Penny Windebank (JISCmail) P.A.Windebank@rl.ac.uk. This entry was posted in JCSGSkills08, skillsday2008 on September 29, 2008 by Michelle Pauli. Andy asked: Does Second Life have a role to play in supporting real life events or a place to have events in their own right? The whole presentation is taking place inside SL – it is in and of SL – but what we see will apply to other virtual worlds. SL participants were asked to brainstorm about what does and doesn’t work within SL. 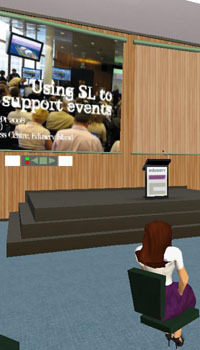 In the meantime, the RL audience get an introduction to SL. SL is a 3D virtual world – a multi-user Virtual Environment (MUVE). It is a commercial offering (run by Linden Labs) and largely proprietory as not many open standards in this area but LL does have a commitment to using open source. World is populated by avatars, also known as residents in SL context. To join to go to the website, choose a name and password and download the client software onto your computer. Quite stringent technical requirements so need the hardware you would need for a heavy computer game if it is to run smoothly. Worth bearing in mind in educational context. Free to sign up but have to pay to own land though subscription rates are low. if you want to own a whole island (eg if you are a uni) then could cost several hundred dollars a month. You can build things – Andy demos this in his building on Eduserv island by knocking together a quick stool. Very Ikea. He then drops the stool on the head of one of the workshop participants. Does he have public liability insurance? This entry was posted in JCSGSkills08, skillsday2008 on September 25, 2008 by Michelle Pauli. Andy: Have heard nothing about web 2.0 and how that is changing events. For the kind of events I go to now – blogging, Twitter, Flickr etc are drastically changing the way we do things. An amplified conference is where everything gets tagged and everything can get pulled together after the event and it brings huge benefits. No tag for this conference? Is web 2.0 changing the way we approach things? Paul: The event today was really a response to requirements and needs for this community. Perhaps in the future the next event may cover these kinds of questions. To answer your question, the amplified event is on the rise. We have been doing it for three years and are very careful with tagging etc. It is easier for us to do this – our audience are very tech savvy. AT our last event we had about 25 Twitterers. And I think increasingly events are going to have to think ab out it. More appropriate for some events than for others but again I go back to audience and each organiser knows their audience. But in the domain I work in, absolutely. Skills day 2008: 12 months on! Paul begins by entertaining the room by introducing Ming as not a social network tool the story of heroic Flash Gordon and the evil Emperor Ming, the nemesis of Flash Gordon. He went on to discuss Tools, technology: “It’s about the audience stupid”. RSC London have been using Wimba classroom and Bernard explained the benefits of using the tool and then gave a short demonstration. Cary set up Instant Presenter to demonstrate the tool, and then Alistair presented on accessible email from Winchester, using Instant Presenter. Maryse: RSC Eastern has used online tools for a couple of years for smaller events – have used Instanter Presenter (IP) and trialled some others. Have a licence to try out Elluminate for this year and will run a pilot. Want it to be a collaboration with other RSCs. One of the features we are very interested in is the accessibility features and working with Techdis to really give this a trial. Malcolm: used IP a few times but only had Elluminate for a short time. Have been asked to explain how the experiences we have with those two and the kind of pitfalls encountered with this kind of delivery. 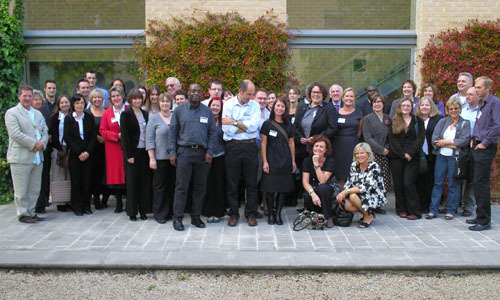 Skills day 2008: are your events accessible? Cary MacMahon: are your events accessible? I’m the new JISC Techdis coordinator – “the new Sue”! At Intute we wanted to formalise our approach to events. We do subject specific as well as generic ones and we really wanted to improve for the JISC conference and now we have these guidelines which have worked for a number of conferences.